Ahoy me hearties! Set sail with Captain Morgan and Bernard Shaw in this high seas adventure to find buried treasure on Cutthroat Island. But beware matey, the wicked pirate captain, Dog, is after the same treasure. So let loose the mooring lines and may the wind fill your sails. Do you have what it takes, or are you a wimpy land lover? Although the movie that this game is based off of did poorly in the box office, this game did not follow suit. Packed full of action and fighting, this game will have you playing for hours. The awesome graphics featured background animation and well-rendered muzzle flash on gunfire, and the sound effects and music will keep you riveted. 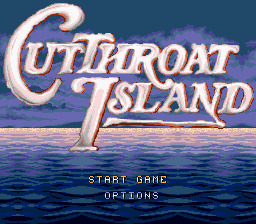 Play as either Morgan or Shaw in this side-scroller to find the famed treasure of Cutthroat Island. Whichever character you choose makes little difference, because they both do the same thing. Don't forget the two player mode, which is cooperative with both Morgan and Shaw side by side. Work together to defeat your foes and earn your reward! Use your sword or your fists to fight British troops and evil pirates, and don't forget to defend yourself while fighting. It helps greatly because there is no way to heal yourself. When you reach 0 hit points you lose a life and come back at full, but remember you can only do this four times. Learn new moves and combos from friends along your way that will help you overcome your enemies. Fight through towns and defeat Captain Dog's most trusted crew members to get to your final goal, the Treasure and the infamous Captain Dog. 'Dead Men Tell No Tales,' so fight to win.